Buckwheat is the new oat. I've been reading about it everywhere and I'm getting on the buckwheat bandwagon. Why, you ask? Well, it's deliciously nutty, crunchy, naturally gluten-free, protein- and fiber-rich, high in vitamins & minerals, cholesterol-lowering, satiating and grain-free. It's technically a seed and contrary to its name, unrelated to wheat. It originates from China and Siberia and is most popular in Russia. You may have eaten it in its flour form in blinis, French galettes or even Japanese soba noodles. It contains the amino acid lysine, which makes it fantastic for vegans and vegetarians looking for high protein sources! This light green pyramid-shaped seed has an outer skin that can be tough for some to digest. Therefore it's smart to soak overnight to break down the enzyme inhibitors and coax the seed to sprout = come alive. 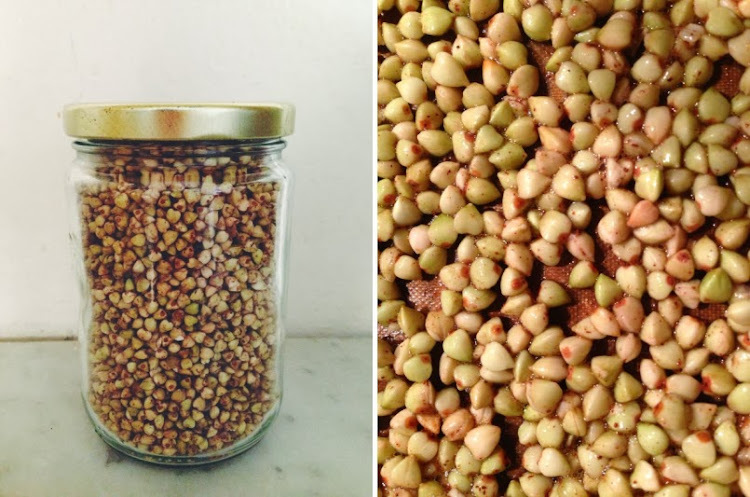 After that, dry it out in an oven or a dehydrator, or you can make kasha -- toasted buckwheat! Either way it will produce a crunchy, nutty treat. This recipe is inspired by the brilliant Laura Miller of Sidesaddle Kitchen. She soaks the buckwheat overnight, adds seasoning and then dries it out in her dehydrator. I continued the story by sprouting it as it can make nutrients more available to the body. This pseudo-grain can be enjoyed with yogurt or milk or even added to your favorite granola. My husband likes snacking on it just as is. You choose! And do let me know how you like to enjoy? 1. Rinse the buckwheat groats thoroughly, ensuring there is no debris. Add to a large bowl with triple the amount of water. Let sit overnight or about 8 hours. 2. The next morning, rinse and drain. At this point, place the rinsed buckwheat back into the clean bowl and cover with a tea towel. After about 5 hours, rinse and drain again. Repeat every 5 hours until you see sprouts, making sure to rinse and drain well before beginning with step 3. 3. In a dry bowl, add the well-drained buckwheat, maple syrup, cinnamon and salt and mix well. Place on a parchment-lined half sheet pan, making sure to evenly spread out the mixture so that all the groats have a chance to dry out. Bake in a 140C / 250F degree oven for 20-30 minutes, taking care that the oven does not get too hot. Allow the groats to sit in the oven with the oven turned off until completely dry and cooled. Then place in an air-tight container. Enjoy! You know, I don't think I'eve ever eaten buckwheat in groat form! Super interesting. I have a bag of buckwheat flour that makes an appearance on waffles etc., but now I'm thinking I need to branch out with the whole grain. Good to hear from you Eileen! Yeah I think I've become addicted, it basically tastes like nuts -- very delicious! Let me know when you try it out!